The Union Cabinet chaired by Prime Minister Shri Narendra Modi has been apprised of the Memorandum of Understanding (MoU) between India and Belgium on Cooperation in the field of Information Communication Technology and Electronics (ICT&E). The MoU was signed during the State Visit of King Philippe of Belgium to India on November 7, 2017. The MoU intends cooperation between India and Belgium including sharing of best practices in the area of ICT&E policy; Digital agenda technology and research with special emphasis on developing ICT&E manufacturing and services; e-Governance and e-Public Service Delivery, participation in conferences, study visits and exchange of experts, cyber security and to resolve issues of data adequacy, market access, trade and services. Ministry of Electronics and Information Technology (MeitY) is collaborating with a number of countries for fostering bilateral and multilateral ICT cooperation. ICT, in the present knowledge era, has the potential to play an important role in fostering economic growth, as well as in other dimensions of economic and social development of a country. MeitY has entered into MoUs/Agreements with counterpart organizations/agencies of various countries to promote close cooperation and exchange of information in the area of ICT. To further enhance cooperation with various countries, particularly in view of the new initiatives taken by Government of India like “Digital India”, “Make in India” etc., there is an increased need for exploring business opportunities and attracting investment in the technology sector which are of interest. India and Belgium enjoy close and friendly ties. 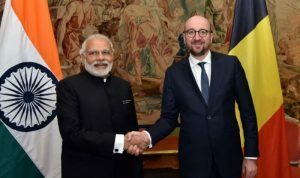 Belgium is India’s second largest trade partner with the European Union (EU). Belgium has expertise in the Communication Technology sector especially in the field of e-Governance and electronic ID card and Tax on web etc. During Prime Minister’s visit to Brussels in March 2016 to attend the EU Summit and bilateral dialogue with Belgium, it was proposed to sign an MOU in IT and Electronics sector between India and Belgium. Thereafter, Minister for Electronics and Information Technology (ME&IT) had a meeting (on February 7, 2017, in New Delhi) with the delegation led by H.E. Mr. Alexander De Croo, Deputy Prime Minister and Minister for Development Cooperation, Digital Agenda, Telecom and Postal Services of Belgium on areas of mutual interest. During the meeting, both sides affirmed their commitment to work together for the digital empowerment of people on Digital India and Digital Belgium.